C&E Design's pre-engineered, pre-fabricated PLC control panels are available with PLC's from a number of different manufacturers. These panels are available in either expandable or non-expandable versions. The fabricated assemblies were conceived for use as a starter kit for the "do-it-yourself" end-user. They are built for the customer who is at least fundamentally experienced with PLC systems and qualified to make a proper hardware selection. These panels are ready for you to adapt to your specific application by providing finalized wiring diagrams, connecting your field wiring, programming and downloading your ladder logic, and commissioning. Our "non-expandable" models are designed with the assumption that the I/O provided is all you will ever need. Although there is adequate panel space and terminal blocks for adding door-mounted pilot devices, landing field wiring, etc., it will NOT be practical to add additional I/O to these models. These models are compact in size and very cost-effective. In some PLC manufacturers lines, we offer "lower-cost expandable" and "medium-cost expandable" lines of standard PLC panels. Like the "non-expandable" models, these will be equipped with adequate panel space and terminal blocks for you to add door-mounted pilot devices, land field wiring, etc. However, they WILL be equipped with empty PLC slots and / or panel and din-rail space for you to add a limited quantity of additional I/O, terminal blocks, relays, etc. as you may need, now or in the future. Also, some expandable models are equipped with larger 24VDC power supplies. All our standardized PLC panels are fabricated in standard NEMA 12/13 enclosures assembled by experienced technicians. Optional price adders for each enclosure size are listed to change to NEMA 4X Stainless Steel. All components utilized are top quality and UL-listed (where applicable). A hard-copy wiring schematic is provided with each cabinet ordered. This schematic details all internal panel wiring, including power circuits, fusing, I/O wiring, etc. All wires are numbered based on C&E Design's standard wire numbering scheme. The customer may customize and complete these diagrams for their specific application(s). Detailed cabinet elevation / layout drawings are considered proprietary and are not available. However, all cabinets are constructed using the same general arrangement. All incoming power terminals, receptacle and 24VDC power supply are mounted along an upper din-rail. The PLC components are mounted in the center of the panel. Either one or two lower din-rails provide mounting for all field terminal blocks. 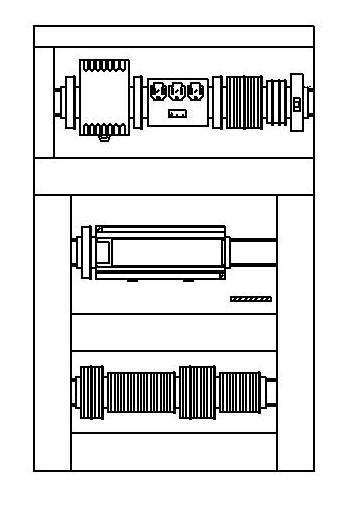 Covered wireway is provided for all internal and field wiring. The following image shows a typical panel arrangement. Each panel is equipped with terminal blocks and a main circuit breaker for incoming 120VAC power. The main circuit breaker provides the line input for a number of individually fused branch circuits. A fused-input convenience receptacle is provided on all models. Also, a fused-input and output 24VDC power supply is provided on all models, with the 24VDC wired to jumpered terminal strips. All PLC I/O points are wired at our shop to terminal blocks for use in terminating customer-supplied pilot devices or wiring from field devices. All wiring internal to the panel is factory-tested for continuity prior to shipment. Note: Where multiple manufacturers are listed, we will provide based on current availability and pricing advantage. However, all components will be UL-listed.